Cash Bomb Classic Slot Mini-Game Review - Casino Answers! 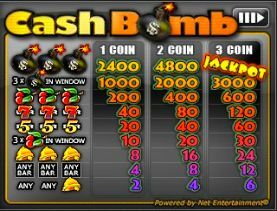 Cash Bomb is a 3-reel, 1-line classic slot mini-game developed by Net Entertainment, featuring a progressive jackpot. You can play the Cash Bomb classic slot mini-game at Bovada. Coin values on the Cash Bomb slot machine are fixed at $0.50 per coin. You can play 1-3 coins on the Cash Bomb mini-game. You can bet $0.50, $1 or $1.50 per spin. Casino Answers recommends playing the maximum bet on the Cash Bomb slot game to be eligible for the progressive jackpot. To speed up gameplay, press the button with the Hare symbol on it. You can skill stop the reels by pressing the Spin button in the middle of any spin you make. To play, press the “Bet” button to select your bet followed by the Spin button. You can play all three coins by pressing the “Max Bet” button. Cash Bomb features a progressive jackpot, which at present time is at $3813.96 and rising. You can win the Cash Bomb progressive jackpot by landing 3 Bomb symbols on the payline on a maximum bet spin. You can play for the Cash Bomb progressive jackpot by playing at Bovada! 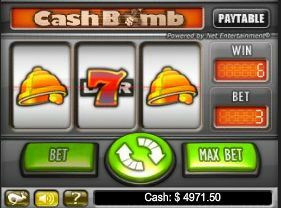 Cash Bomb is a fun game to play either for free or for real money on your favourite Net Ent casino’s website to pass some time. It’s a simple and easy little mini-game that can also lead to some surprisingly large winnings thanks to its progressive jackpot. Play the Cash Bomb mini-slot when you sign up at Bovada! Can players from the USA play the Cash Bomb slot game for real money? No, American players cannot play the Cash Bomb mini-slot game for real money. For a great selection of USA-friendly Instant Play slots, you can visit Bovada Casino. Where can I play the Cash Bomb classic slot? You can play the Cash Bomb slot in flash game format at Bovada. You can play for free in practice play or for real money. If you experience any difficulties with the Flash casino, make sure you have the latest version of Adobe Flash Player installed on your computer.